Starts in the Harbour towards Saint Charles Castle, fortification from theXVIII century, following after till theChurch of Holy mary of the Sands, XII century. After visited the said church, starts the climb to Saint William Mount, taking a deviation at right hand, over 100 m from the church. The climb follows by forest paths taking in the first crossroads at the right hand and after walk over twenty minutes we come to a second crossroads where we detour to the left. 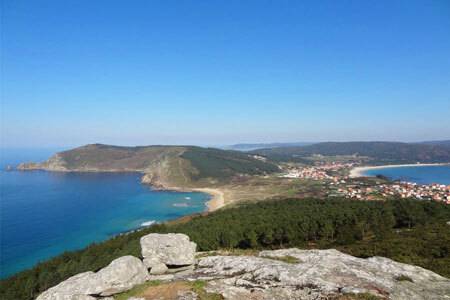 After over 200 m appears a little path at the left hand which takes us toSaint William Mount, from where we can distinguish one of the panoramic views more beautiful from Fisterra Village and its seas. Turning back to the former crossroads we turn again to the left, following a asphalted track which goes up to Facho Mount. At the end of this track we carry on in another one of soil which takes us to the Holy Stones, where we can match other spectacular panoramic of Fisterra and itsisthmus. Turning back the way done, starts the descent by the asphalted track, finding first a viewpoint and arriving later to the Lighthouse. Going out Fisterra towards Atalaya street, we take the path that leads us to the polysport building, turning to the left we go in Lower Saint Martin. To the left, we can find the climb path to Upper Saint Martin. 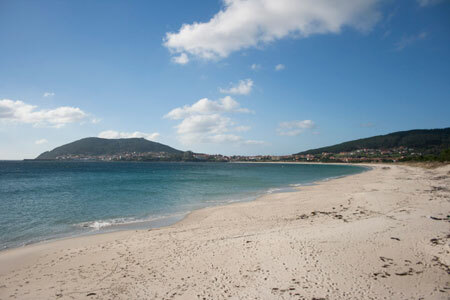 Once reached the village we must get the fisrt detour to the left till arrive to the Castro of Duio. Taking the road which leads to Vilar, we cross the village towards Arnela Beach and do not leaving this road we reachDenle. 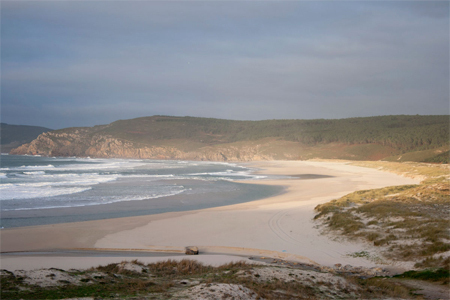 From there the roads goues to Castromiñán, and if we carry on the road we accede to Rostro Beach. Going out Holy Santa Street you must get the first town exit towards Langosteira Beach, walking round its maritime promenade. Immediately after we leave it , taking an asphalted track which carries forward the AC-552, which we must follow till Calcoba zone, to continue after by a small path which take to Mallas village. Once at that point, the path goes first to the church and later to and old school. Starting on there we walk round over 150 m, and in the crossroads the route switch to the left to climb stright towartds theSeoane Mount which, with its 156 m high, it’s the highest in the municipality.